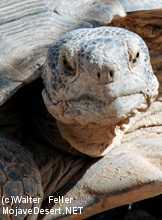 The desert tortoise and the chuckwalla are herbivores that like nothing better than to eat the sweet blossoms of the pretty desert annuals. 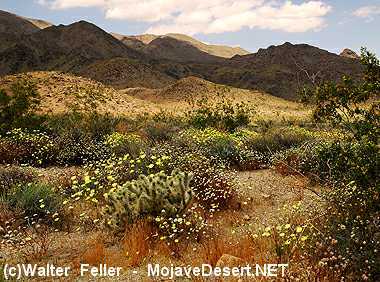 The extent and timing of spring wildflower blooms may vary greatly from one year to the next in the California deserts. Blooms are dependent upon many environmental factors, with winter precipitation and spring temperatures the key ones. In general, spring flowering begins as temperatures rise -- first at lower elevations in February and later at higher elevations in March and April. On mountain tops above 5,000 feet blooms are as late as June. 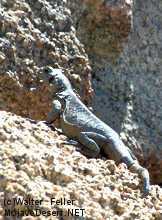 Some believe that spectacular desert blooms occur on an average about once every twenty years and others say that an ideal year comes once every three or four decades. 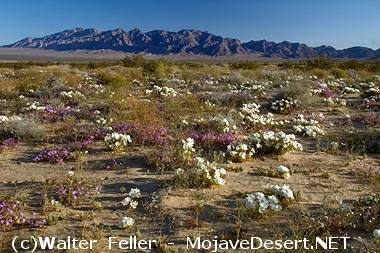 Most spring wildflowers in the desert are annuals. Strict germination requirements are a kind of insurance for the seed, keeping it from germinating when it isn't likely to survive to maturity. Three plants that seem to bloom even in poor years are the Bladderpod, Creosote Bush and the Jimson Weed or Datura.